How do you know when a movement is successful? Well, success can often be measured by the response of others. If something is incredibly successful then you often find that someone, somewhere, feels they need to counter it. Maybe you start a pro-something Facebook group and they feel the need to start an anti-same-thing group. Or maybe, as I witnessed recently, they feel the need to start a Twitter account to counter your success. You see this is what has happened with the positivity movement in Fort McMurray - and what it shows is that it is succeeding. Over the last few years I have seen a definite upswing in positive feelings about this place. Not only are people experiencing those feelings but they are sharing them - on Twitter, on Facebook pages, in letters to the editor, and through every possible avenue. I suppose it was a reaction to years of bad press and negative thinking - but whatever it was it caught on like wildfire. Now, I would caution that we can never forget that we have issues. As any counsellor can tell you the first step is to admit you have a problem - and Fort McMurray has problems. Just like every other community, though, we can have issues AND have pride. We can talk about our negatives while we trumpet our positives. We can address our problems and share our successes. And we have become much, much more successful in spreading a positive message about us, both internally and externally. How do I know it's working? Because it has caused some to think we need the other end of the pendulum represented. It has caused those who have negative viewpoints to think they need to get their message out, too - because they see the success of the positive message, and for whatever reason they feel a need to counter it. There are those who get upset about these negative Twitter accounts, but I'm not one of them. To me it means we are on the right track. It means we are successfully changing the image of this community, enough so that those with opposing viewpoints feel the need to get out there and be more visible.It means we are provoking a reaction - and that, people, is a very good thing. Now, I won't advertise those negative types by telling you how to find them - but what is intriguing is that they have found very little traction. Whenever they appear they receive quite the smackdown from the Fort McMurray cheerleaders, and it is amusing to witness some days, too. The negative types seem to be under the illusion that the cheerleaders don't think we have any problems here, but that is not my experience at all. My impression has been that the cheerleaders are the ones who can recognize the issues but also see the things that are so great about us, too. Perhaps they lean more towards the rah-rah Fort McMurray side, but they are not so blind that they do not see the issues. Sometimes success means that it inspires others to try to counter it. In this regard I think we can count the image-changing movement in Fort McMurray a success, and the more successful it is the more likely we are to see those who wish to tear it down. What we cannot do is allow those who wish to see the focus on the negative side of our community change our own focus - which is to spread the word about the positive things about our community while still talking about the challenges we face. 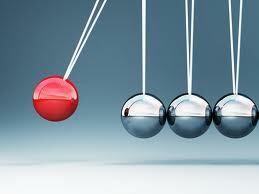 I am one of those who has always believed that the other end of the pendulum swing has an important role to play. I am one of those who believes environmental groups are necessary to counter the far other end of the swing in industry. And sometimes I believe the existence of the far end of the pendulum swing can be used as a measure of success - which is exactly what is happening here in Fort McMurray. Today I celebrate the success of the positivity movement in this community - and I do so because I know it is working. The other end of the pendulum swing tells me so. Whenever something is effective, it's bound to create opposition waves. Love it! So wonderful to meet you this morning, Theresa. Happy Saturday!